I can’t tell you how excited I was when I joined my first book club, but I can tell you how much I immediately regretted it. Don’t get me wrong. I love book clubs. I just hate reading and talking to people. To avoid these relentless chores, I keep a few tricks up my paisley cotton sleeves. 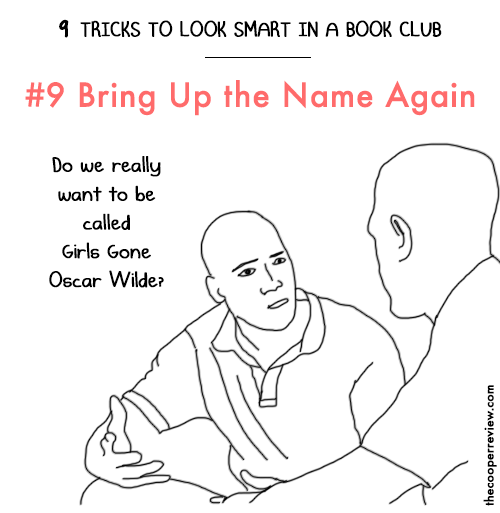 After you join a book club and eventually give up, perhaps you can use these tricks, too. 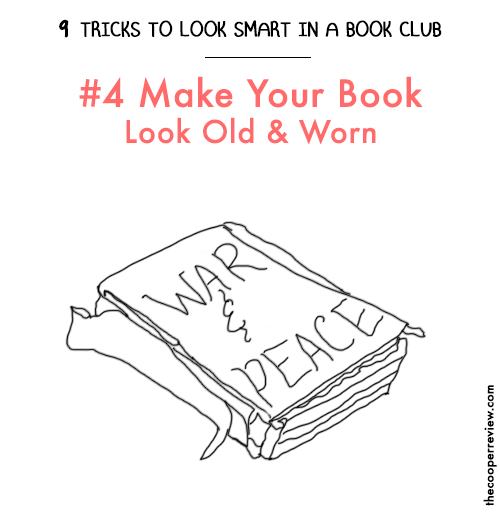 Wearing a giant, over-sized scarf will make you look deeply intelligent in almost any situation, but especially a book club. 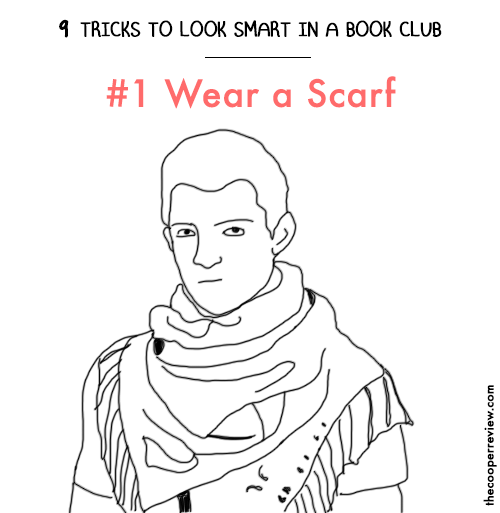 Make sure your over-sized scarf has some sort of fancy pattern on it and lots of fringe. 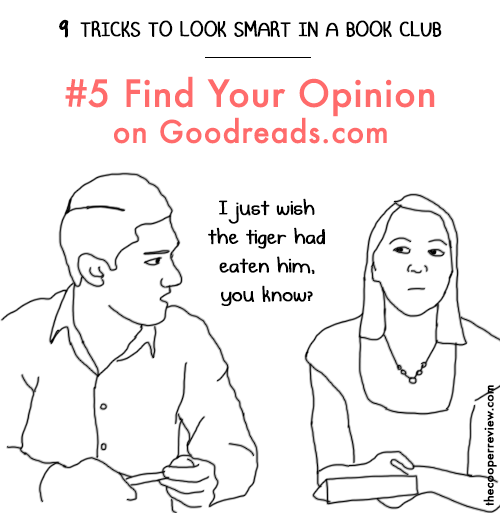 Some of your book club friends might try to shame you for not reading the book. 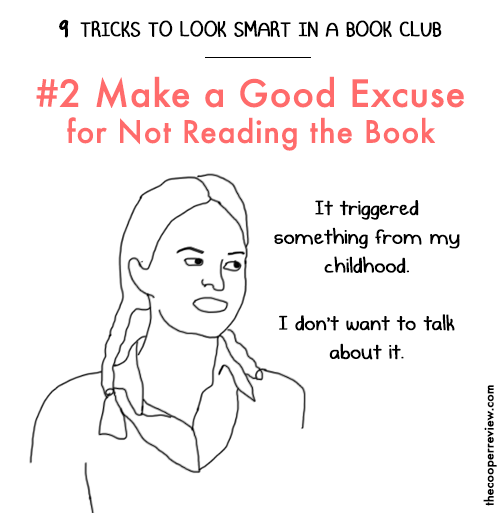 This is called “didn’t read the book shaming” and it is wrong. The Kindle app for your Android or iPhone actually records the most quoted passages by all readers. Simply do a quick Google search for “most quoted passages” + “the name of the book” and see what comes up. 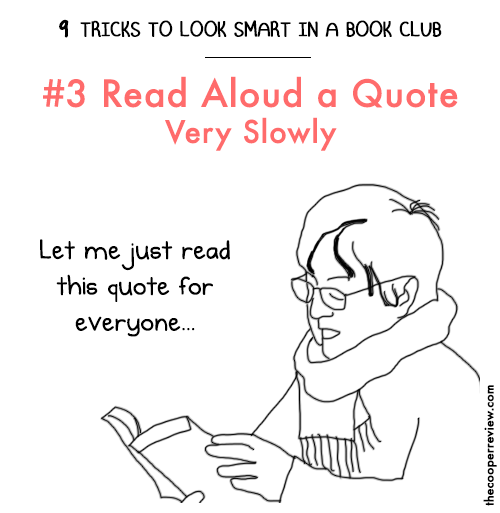 You only need one good, juicy quote to nail that book discussion to the ground. Make sure you’re the first to speak up, so that no one steals your quote. And when you read the quote, read it emphatically, taking long, thoughtful pauses. 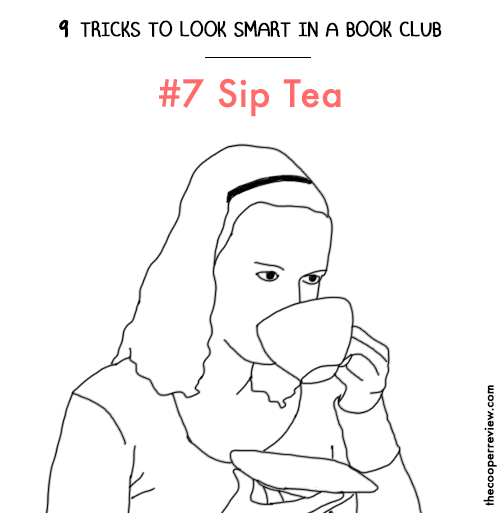 And when you’re done, close your eyes, as if you’re savoring every last morsel of literary goodness. Your book club will eat this up. Some people might say this is a lot of work, but those people haven’t tried reading 10 chapters of a Victorian novel in one night. Head over to Goodreads and look up the book you were supposed to read. There, you’ll find lots of opinions ranging from glowing to inflammatory; simply pick one and use it as your own during the book discussion. This way you don’t have to read the book or think for yourself. 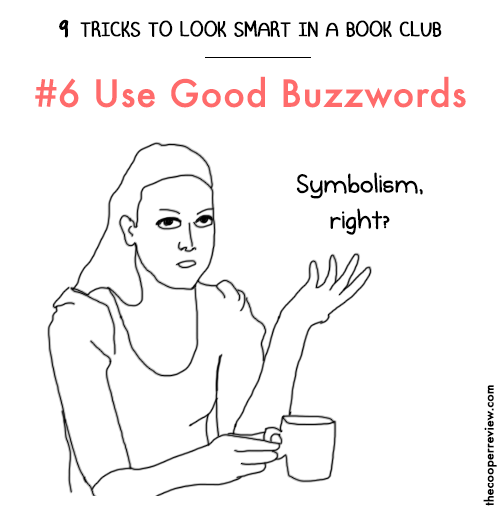 Simply uttering a key literary buzzword has the potential to immediately make you seem bookish. Once you utter the buzzword, just take a sip of tea and nod. Slowly, loudly sip tea throughout the discussion. Say “Hm” a lot, as if you’re deeply considering everything being said. Fight hard for books with a movie version. And make sure it’s a short movie you can easily watch while sleeping on the couch. 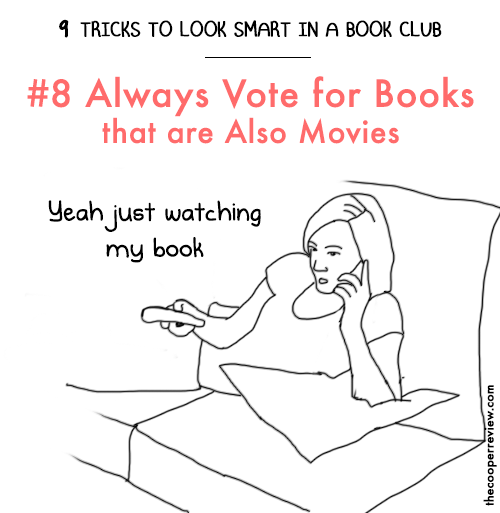 When someone complains that the book you want to read is also a movie – act surprised. Say you don’t even own a TV. Here’s a list of books that got turned into movies. Bring it up. 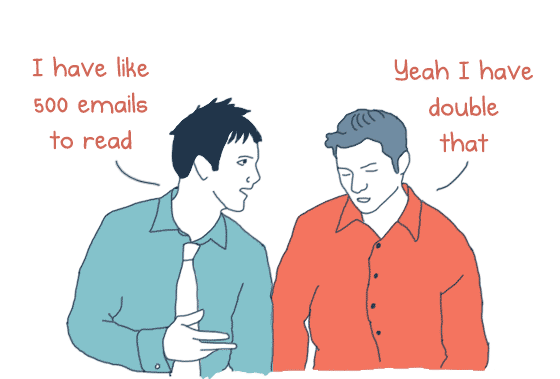 It’ll derail the meeting for an hour and by the time you’re done, it’ll be time to go home. If you enjoyed this, sign up for my free weekly email for more funny schtuff.